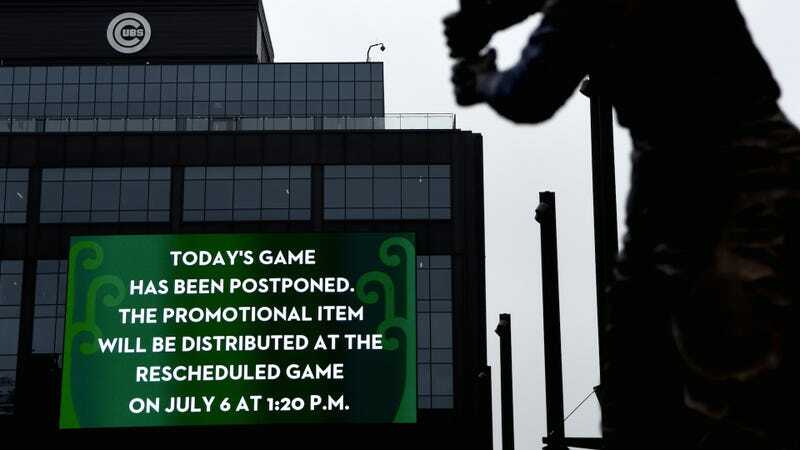 A few hours before the scheduled first pitch, the Cubs called to reschedule yesterday afternoon’s game against the Brewers due to rain. But when the original game time rolled around, it was no longer raining—and things stayed pretty dry for the rest of the day. An ordinary display of caution by the Cubs? A simple judgment error? Not according to the Brewers! This isn’t the first time that the two teams have gotten snippy with one another; a few weeks ago, Cubs pitching coach Chris Bosio not-so-subtly hinted that he suspected Eric Thames of juicing. Meanwhile, the Brewers are still atop the NL Central while the Cubs have slipped into a surprising third place. After today, the two don’t meet again until they make up that rainout in July—which just gives the beef longer to marinate. Homer-Smacking Eric Thames Isn&apos;t Worried About Drug Tests Because He Has "A Lot Of Blood And Urine"